After graduating from Moscow Engineering Physics Institute in 1983 in the field of molecular physics, Mikhail joined Vernadsky Institute of Geochemistry and Analytical Chemistry of Russian Academy of Sciences, where he defended his candidate of science thesis in 1990 in the area of isotope geochemistry and computer simulation of geochemical processes. In 1991-1993 Mikhail was a member of international research team at US-Russia Centre for Contaminant Transport Study in Lawrence Berkeley Laboratory. He participated in the study of radionuclide transport in soils, groundwater and bottom sediments of contaminated reservoirs in South Ural region, including Lake Karachay the most radioactive place in the world. In 1993-1995 Mikhail served as a panel secretary of the Earth Sciences Division at the International Science Foundation, established by George Soros to support fundamental science in Russia. Mikhail was responsible for co-ordination of more than 1500 proposals and grants in geology, geophysics and geochemistry. After obtaining his second degree in Technology Management from the RF Academy of National Economy in 1999, Mikhail effectively combined his research experience with management skills. In 2002-2007 as Mikhail participated in creation of Yukos Research and Development Center. As a head of R&D department and later as a director of the Center he was responsible for development of Yukos R&D program and launch of international research projects in collaboration with world leading technological companies and universities in the area of hydrocarbon production, oil refining and petrochemistry. In 2007-2014 Mikhail was involved in corporate research in Schlumberger and Gazpromneft. As a business development manager of Schlumberger Moscow Research Center, Mikhail initiated a number of joint research projects with RF oil and gas companies focused on development of new technological solutions for exploration and production of unconventional hydrocarbons. As a head of department of innovation and technological policy of Gazpromneft, Mikhail developed and defended the program of innovation development of the Company and launched more than 15 research projects focused on technology for deep refining of hydrocarbons and catalyst production. Before taking over the directorship of the SCHR at the end of 2014, Mikhail worked as a consultant with Skoltech Vice-President for Public Programs and Industrial Cooperation Alexey Ponomarev on building business connections with the Russian and international industry in oil, gas and energy areas. With a very strong background in these fields, Mikhail has brought with him a wealth of experience in developing and managing R&D projects, business development, industrial cooperation and innovation facilitation to Skoltech. 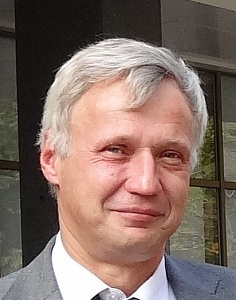 Mikhail is an author of more than 80 publications and patents in the area of isotope geochemistry, radioecology, reactive transport modeling, petrophysics, unconventional hydrocarbons, research project management. Vasiliev, A.L. Pichkur E.B., Mikhutkin A.A. Spasennykh M.Yu, Bogdanovich N.N., et all. “The study of pore space morphology in kerogen from bazhenov shale formation”, Oil Industry, 2015, v.10. p.28-32 (in Russian). Popov E., Kalmykov G., Stenin V., Popov Yu., Spasennykh M. “Thermal properties of bazhenov shales”. Oil Industry, 2015, v.10. p.32-37 (in Russian). Popov E., Кalmykov G., Popov Yu., Spasennykh M., et all. “Thermal conductivity as indicator of total organic carbon for bazhen formation”. Proceedings the 17-th conference «Geomodel», 2015, 4 p. (in Russian). Popov Yu., Pissarenko D., Parshin A., Chekhonin E., Safonov S., Spasennylh M., et all. ”New Workflow of Reservoir Thermal Property Investigations in Application to Thermal Methods of Heavy Oil Production and Basin Modeling”. Abstracts of 21st World Petroleum Congress. 2014. Moscow, Russia. Popov, Yu., Chekhonin, E., Parshin, A., Law, D.H.-S., Pissarenko, D., Miklashevskiy, D., Popov, E., Spasennykh, M., Safonov, et al “Experimental Investigations of Spatial and Temporal Variations in Rock Thermal Properties as Necessary Stage in Thermal EOR”. SPE Heavy Oil Conference Canada 2013. SPE 165474-MS. V 2, 1135-1153. Chekhonin E., Parshin A., Pissarenko D., Popov Y., Romushkevich R., Safonov S., Spasennykh M., Chertenkov M., Stenin V. “When rocks get hot: Thermal properties of reservoir rocks”. Oilfield Review. 2012, 24(3), 20-37. Popov Yu., Chertenkov M., Stenin V., Konoplev Y., Gerasimov I., Spasennykh M., Parshin A. “Experimental investigations of Rock Thermal Properties Using New Methods and Equipment in the Yarega Heavy Oilfield”. Proceedings of the World Heavy Oil Congress, Aberdeen, 2012. September 10-13, 2012, WHOC 12-292, 6 p.
Popov Yu., Spasennykh M., Pissarenko D., Bogdanovich N., Stenin V., Chertenkov M. “Thermal and acoustic properties of Yarega heavy oil field reservoir”. Karotazhnik (Logging), 2011, 7 (205), 27-36 (in Russian). Pimenov V., Popov yu., Klemin D., Spasennykh M. 2009. “Estimate of reservoir thermal property influence on oil recovery results at SAGD application”. Geologiya i Razvedka (Geology and Prospecting), 4, 59-62 (in Russian). Spasennykh M.Yu., Matveeva S.S., and Sushchevskaya T.M., “Fluid–rock Interaction near Large Vein Bodies: Isotopic Evidence,” Geokhimiya, 2005, No. 12, 1322– 1332, Geochemistry International 43 , 1217–1227. Spasennykh M.Yu, Shmonov V.M., Sushchevskaya T.M., and Ignat’ev A.V., “Transport of hydrothermal fluids in Iultin hydrothermal system, Chukot Peninsula: from the results on isotope and permeability study,” Geokhimiya, 2002, No. 4, 626–638, Geochemistry international 40 , 564–575. Sushchevskaya T.M., M.Yu.Spasennykh, A.V.Ignatiev, “The Iultin tin-tungsten deposit: nature of ore-forming fluids based on oxygen isotope data.” in Mineral Deposits: From Their Origin to Their Environmental Impacts, Edited by Jan Pasva, et al., A.A.Balkema, 1995, p.543-546. Bannikova L., Suschevskaya T., Spasennykh M, Barsukov V “Isotopic and geochemical study of the conditions of tin ore formation of Solnechnoye deposit (Far East of Russia)”,Geochemical Journal, 1994, vol.28, p.411-428. Spasennykh M.Yu and Bannikova L.A., “Model of isotope exchange coupling with fluid transport in permeable rock: application to the interpretation of oxygen isotope variations in hydrothermal systems” Geokhimiya, No. 10, 1389–1401 (1986). Ryzhenko B.N., Bryzgalin O.V. Artamkina I.Y. Spasennykh M.Yu. Shapkin A.I. (1985) An electrostatic model for the electrolytic dissociation of inorganic substances dissolved in water. Geochemistry International 22(9), 138-144. Spasennykh M.Yu., Apps J.A. Radionuclide behavior in water saturated porous media: diffusion and infiltration coupling of thermodynamically and kinetically controlled radionuclide water – mineral interactions, 1995, LBL-367380, UC-603, Berkeley, California, 25 p.
Spasennykh M.Yu. Transport and isotope fractionation during phase convection in the melt-solid phase system, Geokhimia, 1999, N4, 227-23/ Geochemistry International, 1999, V 37, N 3. Spasennykh M.Yu. Transport and fractionation of isotopes in magama chamber. Experiment in Geosciences, 1997, V6, N2, p74-75. Spasennykh M.Yu, Tolstikhin I.N. “Noble Gas Fractionation During Degasing of melts”, Geochemical Journal 1993, vol 27, p.213-217. Spasennykh M.Yu. “Technology innovations and corporate R&D management”, textbook, Academy of National Economy under Government of Russian Federation, 2009. Ученая степень: кандидат наук, Институт геохимии и аналитической химии им. В.И.Вернадского РАН, 1990 г.